When conquistadors arrived in the New World in the 15th century, native Mesoamericans had already perfected the art of tortilla-making! In fact, they invented a process called nixtamalization to loosen the husks and increase corn's nutrition. This process requires soaking the kernels in lime water to release bound Vitamin B3 (niacin), yielding corn that, once dried and ground into flour, we know as masa harina. The ideal tortilla is soft and pliable (like an Indian chapati), and speckled with brown. Yet there are variations. Traditionally, the region of Oaxaca made highly renowned thin tortillas, while the tortillas in Guadalajara were thick. And in the mountains of Central Mexico, they treasured their blue corn tortillas. 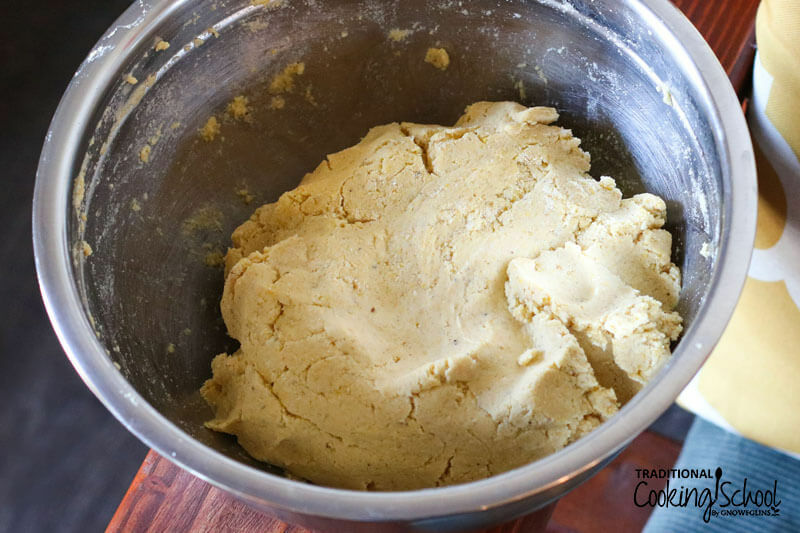 Although you can soak corn in lime water at home (see our Fundamentals I eCourse for instructions), for this recipe I've chosen to buy masa harina. Both Gold Mine and Bob's Red Mill sell organic, non-GMO masa harina. These authentic corn tortillas are made with only three ingredients: masa harina, water, and sea salt. 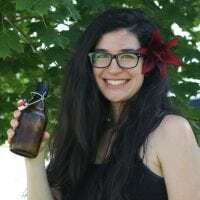 Learn how to make authentic Mexican corn tortillas in only 30 minutes of hands-on time and with 3 simple ingredients: masa harina, water, and sea salt. 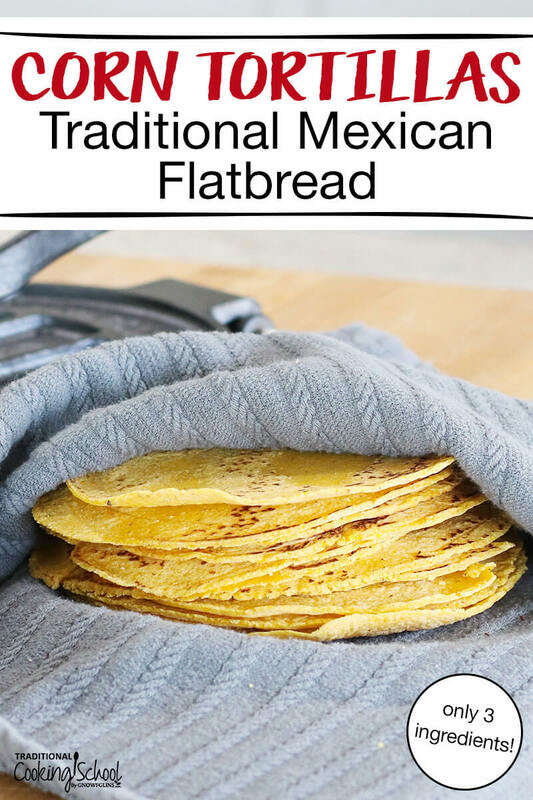 This homemade, traditional flatbread recipe is perfect for tacos, empanadas, enchilada casserole, fried into tortilla chips, or made into chicken wraps. 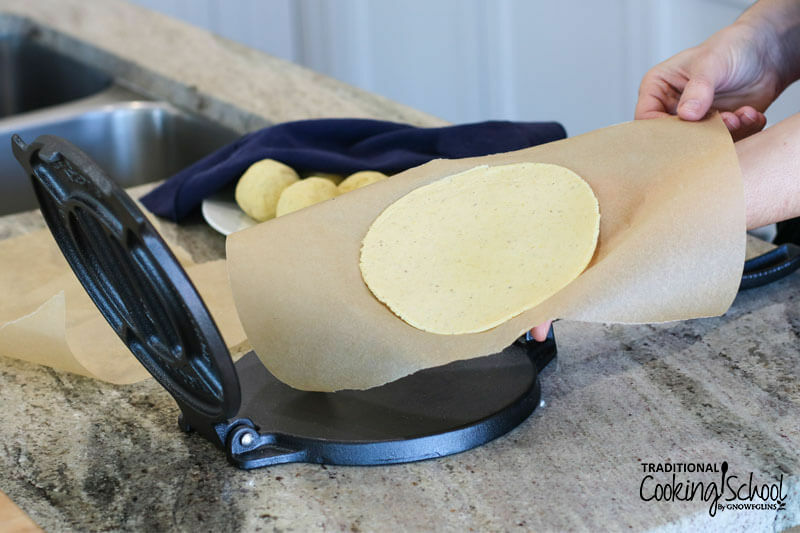 The lunch and meal ideas are endless, and your kids will love helping with the tortilla press! Heat water over medium-high heat until warm, but not too hot to touch. 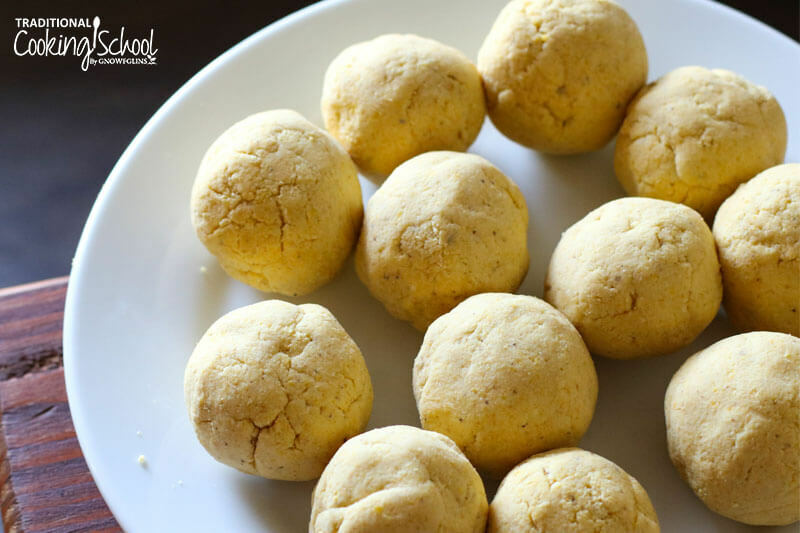 Combine masa harina and salt in a medium size mixing bowl. Combine all ingredients until you form a soft and pliable, not too dry but not too wet, ball of dough. Let dough rest, covered, for 1 hour. Once dough has rested, divide evenly into 12 balls. Preheat a dry cast iron skillet over medium to medium-high heat. 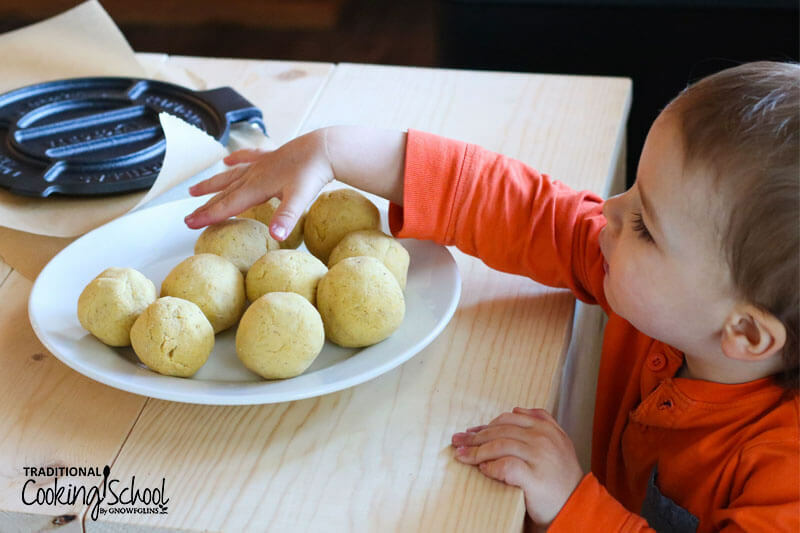 Roll a ball of dough between the palms of your hands, until it is smooth and round. Place it between 2 pieces of parchment paper and flatten it using a tortilla press (mine is 8" across). Or, place dough between 2 pieces of parchment paper and roll it out with a rolling pin. Gently peel it away from the parchment paper. Place tortilla on the preheated skillet for about 1 minute, until it starts to loosen and peel away from the skillet and has nice brown marks. Flip tortilla and cook for 1 minute on the other side. Remove and place it in a clean towel or napkin to keep warm. Repeat until all tortillas are made. 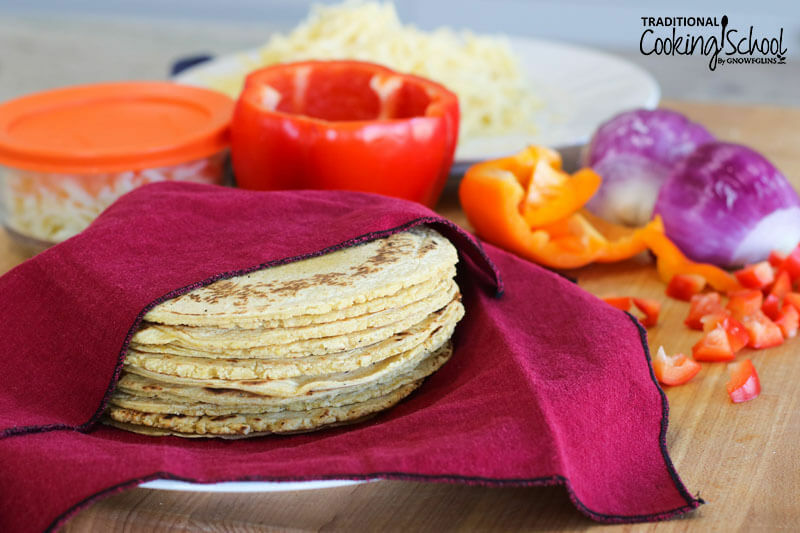 We love this corn tortilla recipe! Enjoy them in tacos, enchiladas, and quesadillas. Kids will love helping, too. 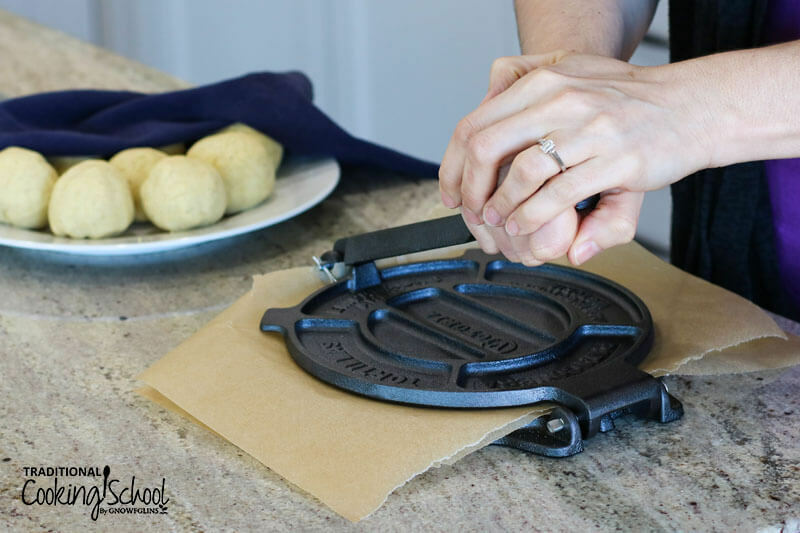 Who can resist trying their hand at a tortilla press? How will you enjoy these authentic corn tortillas? I didn’t know the tortilla press was even a thing! The recipe seems to be so easy to make and my kids have been asking for a “Mexican dinner”, so now I have no excuses but will have to make them! Thank you for the recipe! Hi Jennielle, there’s no way to tell for sure. 🙂 We just have to do the best we can, so we buy organic masa harina. However, if you’re worried, it’s probably best to skip this recipe! I don’t have a tortilla press. Could I use two pans? Hi Jennivieve, you’ll have to use an online nutrition calculator to figure that out. We’re working to be able to provide that information with our recipes, but don’t have it yet. You don’t soak the hasa marina overnight?